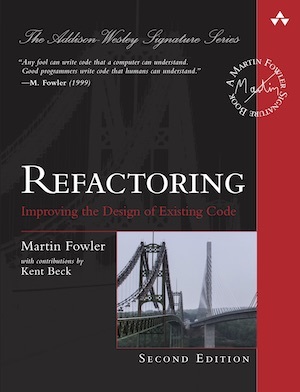 My book describes the process of refactoring and spends most of its time explaining how to do the various refactorings - the behavior preserving transformations. The book opens with a simple example that describes the whole process. There are then some introductory chapters that discuss broader issues around refactoring, the “code smells” that suggest refactoring, and the role of testing. The bulk of the book is around seventy refactorings described in detail: the motivation for doing them, mechanics of how to do them safely and a simple example. This is the second edition of the book, published late in 2018. The first edition came out in 2000. This is the book that I'm proudest of, in that it's had a high impact on the world of software development. Several development environments now automate many of the refactorings described in the book. Refactoring has become a full-fledged part of the software development lexicon (sadly also leading to misuse). For more background on the book, you can take a look at a couple of interviews I've done about it. Summarizes the changes between the first and second editions. Thoughts about the book: including its scope, cover choice, target readers.